Physical Therapists NEED consumer awareness! For too long, the profession of physical therapy has been internally and externally regarded with a naive purity of human caring and legitimate sciences. Now of course, the art of caring and a loyalty to solid research is really a business strength. However, to be real, healthcare (physical therapy included, of course) is truly in a battleground of BUSINESS principles - and - as we all know, the world of business is far from a pure and noble battleground. Our biggest business flaw is a marketing problem; it is another classic case of content vs. distribution. We obviously have solid clinical content & provide good services. However, as a culture, our profession hasn't been doing the best job of distributing that content to all of our access points (regardless of if PT's have direct access or not) - be it physicians, other providers, through media, or word of mouth - it seems like, still, no one really knows what we do. And, how can the public increase in demand if they don't know the supply exists? Obviously, consumer awareness will solve consumer access; in the marketplace, people are VERY good at getting what they want, when they want it. 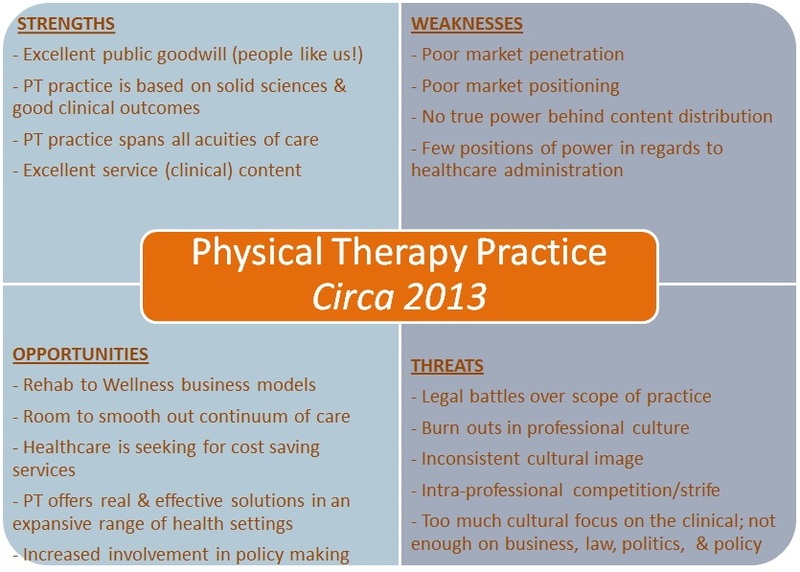 I propose that the physical therapy profession has not done sufficient marketing work to create the demand we want. Change the marketing culture of physical therapists. 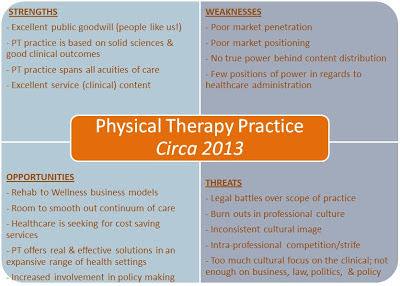 Engage in new business models in providing physical therapy services. Breach new healthcare roles as physical therapists. Create corporate unity in law, politics, and policy. If you are a physical therapist working in the acute care or SNF setting, THIS IS FOR YOU. If you want consumer awareness, if you want nurses to think you do more than walk patients down the hall - you NEED to take every chance you have, talk to every interdisciplinary team member you come across - share your expertise, your passion, and your personage. What so few physical therapists truly conceive is that the profession isn't what services you are trying to market; you must market your very self! A good marketing strategy links emotional content with market demand; people identify with relationships, however, tend to be less selective with packaged services/objects. If you notice a nurse rubbing their neck, ask them about it. Give them that professional courtesy consult. I, personally, will give a quick manual therapy assess/treat and cue them for postural correction just to start with & go from there. Imagine the power of giving a different interdisciplinary team member 5-10 minutes of your daily time to address the common neuromusculoskeletal issues that we all live with? How about discuss recent weight loss and exercise trends people are talking about in the lunch room? 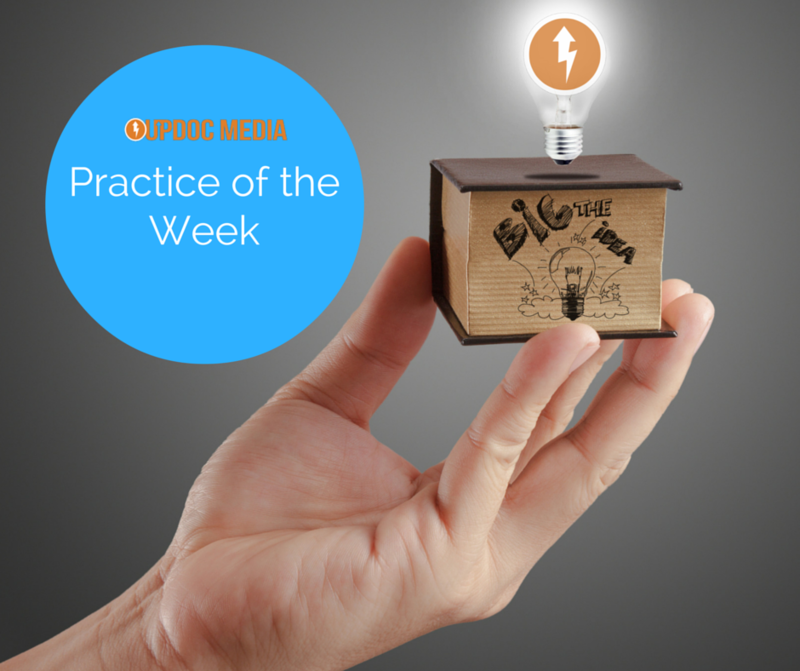 Now you're more than a just professional, you are living a marketing presence for PT practice! There is SUCH a lack of physical therapists promoting their practice and expertise through traditional media; television, radio, and movie theater previews are still powerful marketing agents. However, one area physical therapists are truly mastering is social media. Still, there is more work to be done, we need to engage our consumers on social media outlets - especially Facebook and Twitter. Though these venues, physical therapy can be promoted through referral incentives and social media interactions. I'll talk more about this in the "Engage in New Business Models" section, but, just think if discounts were given for referring a family member. How about a free wellness massage giveaway for liking a Facebook page or for a patient uploading their home exercise program on YouTube? Food for thought. Remember, the answer resides with consumer demand. 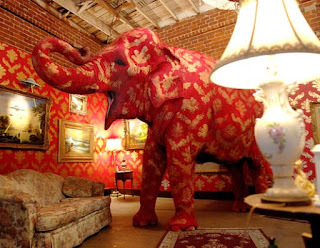 If consumer want it, they will get it. We need to give them the tools. In an outpatient setting, this is made easiest. Imagine there is a return patient waiting in the lounge, he is feeling a LOT better. What a great opportunity to have office staff educate about direct access for PT's! "Sir. I see on your file you went to urgent care for your back pain. Your doctor waited two weeks before referring you to a physical therapist. Wouldn't it have been better if you could come to us directly on the day you got hurt?" How interesting... the answer always seems to be "YES!" Hand the patient a single page info on direct access, legislator phone numbers, fax numbers, e-mails, social media outlets - even have a single page fax ready to go, all they have to do is sign and the office will fax the letter/petition for them! I hope you've enjoyed the business perspective of this new blog. I have the other three recommendations, an amazing video regarding marketing content, and more discussion coming up in Part 2 of Consumer Awareness & Access to Physical Therapists. Kerfoot Electrics, the best electrical contractors in the Sydney area. Quality Commercial Electrical & mechanical services and contractors. East Coast Generators | Specialists in generator hire generator sales and generator service. Marine Muscle brings the end to the plague of poor-quality supplements that exist on the market in the United States today. Gain fast with Marine Muscle.